Great! Added to the main site now. Sorry, but what's the use case here? With Sonoff it's either hard or impossible to add a radio or rs485 transport, so I don't see it as a real gateway. The use case is that you can use the sonoff with all controllers that support mysensors. With all my respect to the project and people behind it I believe that MQTT is more widely used than MySensors. So for me it would be more logical to add another MQTT client to the network rather than introduce any additional gateway. Just my 2¢. This is not really a gateway. You can use the esp8266 gateway sketch, disable the nrf24 / rfm69 and directly attach sensors. So basically it's an relay actuator which is configured as a mysensors gateway. I think what's throwing everybody off is applying the word "gateway" to this sonoff device. Wouldn't it make more sense to have it remain a relay actuator (i.e. just a node) and to have the mysensors gateway be something else (of which there are many examples on this website)? i.e. it makes more sense to have it be a mysensors node (or MQTT node if that's your architecture) than to have it be a mysensors gateway. Wouldn't it? Maybe a good solution to the node/gateway dilemma is adding WiFi transport for nodes to MySensors? Then defining one or more WiFi gateways to connect sensors to. You could then use WiFi enabled devices, such as ESP8266 as sensor nodes. You could use these as radio interfaces to Arduino nodes, with their original serial-to-WiFi firmware and treat it much like the RS485 transport. Yup. It's either that or do the MQTT thing (which, personally, I favor, though right now it's a minority opinion) like AndrewZ said. I don't see the problem here. An direct ip connection between the controller and the node is perfect for critical nodes as less components mean less things that can fail. I have flashed a Sonoff Touch switch with the esp8266 gateway sketch and it is running just fine. Or am I missing something? @Jan-Gatzke What code modifications have you done to get the touch buttons to work or do they work like "normal" buttons? I really like the built-in form factor and was thinking about ordering a few. All the touch stuff is handheld by an ic. You can use it like an normal button, active low. It is connected to pin 0. I have made a two way switch of it. With a long press I cycle through multiple scenes which control the color of my tv's led light. With a even longer press I can switch the tv light off. I can share the code when I found the time to clean it up. I like the OTA update function of the esp very much. It's much simpler than the rf24/ Arduino solution. My sketch provides a browser based update function with just 5 lines of code. This was important to me because I don't want to get my switches out off the wall for every update. For the eu version of the sonoff this is mandatory because the programming header does not fit when the device is mounted. Ok, I just wiped out (hopefully) all my passwords and IP information. The EthernetGateway sends data received from sensors to the WiFi link. The gateway also accepts input on ethernet interface, which is then sent out to the radio network. Enter "ip-number:port" in the ip-field of the Arduino GW device. This will temporarily override any serial configuration for the Vera plugin. See http://www.mysensors.org/build/esp8266_gateway for wiring instructions. Not all ESP8266 modules have all pins available on their external interface. This code has been tested on an ESP-12 module. Hardware SHA204 signing is currently not supported! Make sure to fill in your ssid and WiFi password below for ssid & pass. //Button has been released, trigger one of the two possible options. //Just been pressed - do nothing until released. //Domoticz does not like 1 as scene. So we start with scene 2. @Jan-Gatzke Thanks! A Interesting and inspiring code example. Did you think about using the arduinoOTA option instead of the httpUpdater? Yes, I thought about that. But during my tests the web updater was just most reliable and easiest to use. Arduino ota needs extensions to the IDE and sometimes the node was not found. Web updater works out of the box and never made any problems. This sketch is awesome, First MySensors sketch I have used that worked straight off the bat. Hold down the button on the Sonoff when you power it up to enter flash mode. @Bryden It's hidden in the code of the sketch "* Hold Sonoff button when attaching FTDI to flash." it depends on if the controller supports ESPEasy/espurna "out of the box". Not all controllers even have MQTT support. @warmaniac the sonoff works just like any sensor except its configured as a gateway since that is what is needed for esp8266+mysensors . Mqtt or ethernet/wifi is just a matter of taste and your setup, skip mqtt if you don't have anything else using it. I want to use standalone Sonoff (one device) than I must install broker (Mosquito) on my raspberry where is Domoticz running ? And how can I add than that device or how can this setup looks like. after that Sonoff blik twice. What may be wrong ? Does anyone know how I can request the current state of the relay via MQTT. Eg HASS has rebooted, forgotten what state the switch was previously in, then it wont work untill power is cycled to the sonoff. If you're using the mysensors component in home assistant, you can activate persistence to load devices and last known state when home assistant restarts. How do you load the relay sensor in Vera after connecting the Sonoff as a wifi gateway as described? Hi, I see in the instruction a note about not being tested against 220v so just to confirm it is working fine, I've uploaded the sketch to one of those with the power socket plug embedded and I'm able to control it remotely. Great job! As a side note, I'd copy and paste the "Sonoff specific details" instructions from the sketch also into the build page. My bad because I've missed them and had to google a bit on how to upload the sketch but maybe also others may experience the same. @user2684 Thanks for reporting. I have updated the instructions with the Sonoff details. I was wondering if some of you already know if Espeasy supports the pow versions power usage reporting. I checked the github and couldn't find it. I know Espurna supports it (as a domoticz MQTT). However when I check the REST API of Esputna there is nothing noted about the power consumption (only humidity and temp) requests. Regards, and keep up the good work. is it reachable via IP or is it totally unresponsive? I had same problem too.. When is longer not turned on, Sonoff disconnects from wifi , that ip is not in client list, in my case I only turn sonoff on throught black button on the top and than it is okay about day-two. I have few sonoff and I just installed one with this script to replace a dead 433 device. So thank you very much for the script and the tutorial. 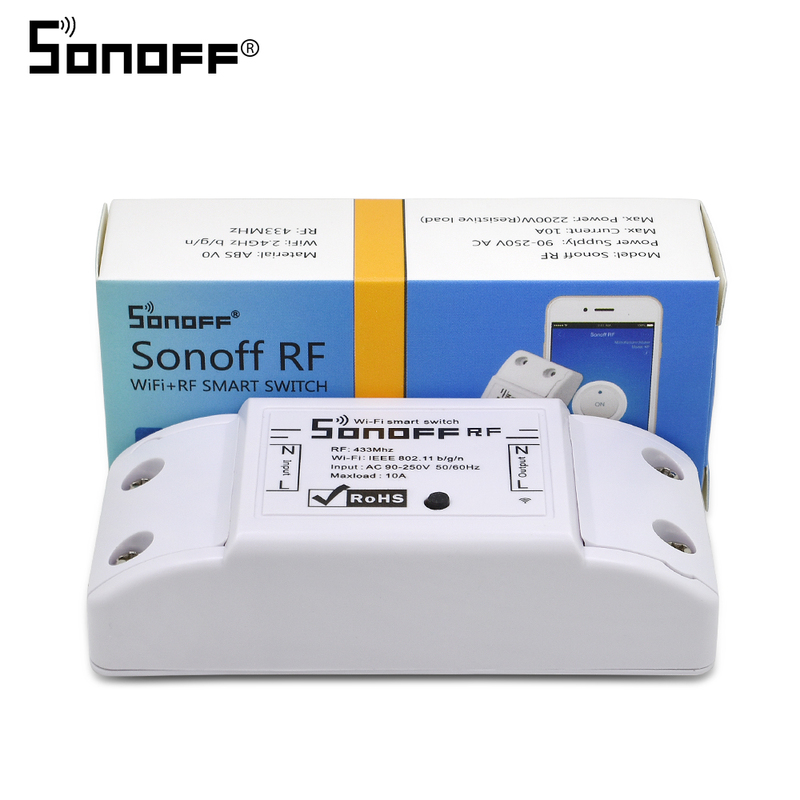 Reports of regular wifi connection losses are what kept me away from sonoff until now. Maybe the script could check wifi connection regularly and force a reconnect. Something like in the link below ? Another I have had these running posts. I have had 3 Sonoff relays running on 240v 50Hz for 2-3 months straight. 2 of them in IP67 outdoor lights with Phillips LED Lamps, switch on and off several times per day, Not a single hardware issue. Yes over one month and very reliable, but with Domoticz is not integrating very well with my old 433MHz remote controls (that I use for my remaining 433MHz module until they are replaced). Making me think about a small plugin board to control the sonoff through serial port, so it would make a real MySensors node for 10$ and avoid all the power supply, relay etc etc soldering and not rely on wifi. I remember reading non to connect any other serial device while the Sonoff is connected to mains or it would get damaged. I was referring to what @Nca78 said about controlling the sonoff through serial port. I supposed that's when you connect your computer to sonoff using serial adapter ? I see no reason for damage if both es8266 and atmega are connected to the same VCC/GND. @gohan yes with it could happen, but if you just connect a standalone Arduino powered with VCC GND from esp8266 there's no reason to have a problem. But why would you want to connect another arduino to the sonoff? @Ed1500 Thanks for your answer. Went for espurna.. Tested tasmota, but compared to espurna it was kind of slow. Works stable for quite some time now. To have a real MySensors node that can be directly controlled with another node and not relying on wifi and controller. Sorry but I am still missing the point. If you have to make a mysensors node anyway, why not make a classic relay node? @gohan because when using the sonoff I do not have to care about the power supply/safety, to find a case that is safe for electrical device and I only have a few things to solder. So just solder a few low voltage components on a PCB, plug in the sonoff and get a safe main powered actuator. I have seen how to hack some of them to add a couple of wires directly on the esp8266 chip to get an i2c bus. @efflon Do you know how I can setup the sonoff gateway on the Vera Edge? I used the MySensors plugin to add the sonoff to the network but can't get the relay to toggle.. Help is much appreciated!! Thanks!! If someone wants, I create a modification to cooperate with DHT22. Data pin of DHT22 is connected to pin 5 of sonoff. * The sonoff header left to right, relay above, LED below. * In arduinoIDE 1.6. * choose Generic ESP8226 module. * Hold Sonoff button when attaching FTDI to flash. Do you know how I can setup the sonoff gateway on the Vera Edge? I am using a Vera Plus. I did not go the route of MySensors for my Sonoffs. I use the ESP Easy firmware with a slightly modified Vera plugin. Here is my BLOG post on how to do it. You could still go the MySensors route. I just figured I'd show another alternative to this. @Jan-Gatzke It is my understanding that ESP Easy can send and receive MQTT messages, couldn't you just use a MySensors MQTT gateway if you wanted to keep it on the MySensors path? @dbemowsk You cannot because MQTT is just a transport and not a strict data format. You can however use MySenSors MQTT + ESP Easy MQTT + a broker + node red + a controller. Node Red can do data conversions and integrate everything. @Jan-Gatzke I was just speculating. I do not use MQTT, so I am by no means an authority on the subject. @gohan I know some controller are aware of ESP Easy via MQTT. If you controller does not support this directly, you have to integrate it manually (with node red). In my opinion scenarios, where MySensors with ESP Easy frontend would be of use, do still exist. IMHO there is one, when your controller is down, gateway is down or whatever, you could still have direct control or the light switch from a MySensors button with node to node communication. How do you do that if the sonoff is only having wifi? @gohan won't this option miss some features? @Jan-Gatzke for a sonoff there aren't many options and also a wired button you are pretty sure it would always work. For the Sonoffs, you could wire an external button directly to the onboard button which is on GPIO 0, or you could wire it to GPIO 14 which is broken out on the programming header on most Sonoffs. Some older Sonoffs didn't have GPIO 14 on that header. Once you have a button or switch wired on, you can then change the code or do some firmware scripting depending which flavor of firmware you use. @dbemowsk Do you know if there is a way to use vera edge / plus with Tasmota firmware instead of EasyESP?? @sam9s I have never played with Tasmota, so I have to say that I don't know. A Vera plugin would have to be coded or modified as I did with the HTTP Switch plugin to make it work if there is not one out there already. I am assuming that you looked at my blog post on the ESP Easy way. Can the Vera plug in work with mqtt? @gohan Here is a plugin for MQTT using Vera. You would still need to have an MQTT Broker set up though. I am surprised that there is not an active MQTT plugin for Vera in the plugins section. Didn't find anything when I did a search for MQTT. I will just leave that here for other like me that wondered for hours why they could flash their sonoff, but it did not react once plugged to the main. You need to setup your arduino with DOUT as flash mode. Other mode will flash without errors, but the device will appear bricked. @tripy yes, you are absolute right - you need to set the flash Mode to DOUT for flashing the newer SONOFF generation (the SONOFF's with the hidden green LED). Maybe someone here has a code for Sonoff RF with support 433 MHz receiver? In my opinion, paired with a wireless wall switch, this will turn out to be quite a cheap and convenient solution for lighting control. The cost of a set of relay and switch about 10 dollars. @electrik Now I just read the description of this firmware. To do this, I need to understand how to work with MQTT. I hoped to find a simpler solution. Ethernet gateway is much easier to connect. Mqtt Is really easy to use in fact. Just follow a tutorial to install mosquitto and you're ready to go. @electrik Thanks you! Now I will order everything I need on TaoBao in China. I just yesterday learned about the existence of the Sonoff module with 433 MHz radio support and wall switches for them. @gohan I use OpenHAB 2. As I understand it, it also integrates well with Tasmota.